There have been plenty of stories in recent years about Facebook addiction, with users unable to drag themselves away from the social networking site for more than a few minutes without breaking into a cold sweat or something worse. One user keen to kick the habit is Wellesley, Massachusetts resident Rachel Baier, who decided that a financial incentive was needed to make it happen. The enterprising 14-year-old high school student has struck a deal with her father that involves him handing over $200 if she manages to stay off the site for at least five months. “It was her idea,” Paul told the Daily Dot. “She wants to earn money and also finds Facebook a distraction and a waste of time sometimes.” Rachel initially asked her father for $70 in exchange for a much shorter period of abstinence, but Paul came back with a $200/five-month offer. The pair have even gone as far as to draw up a contract (below), which Rachel’s father, Paul, posted on his blog. 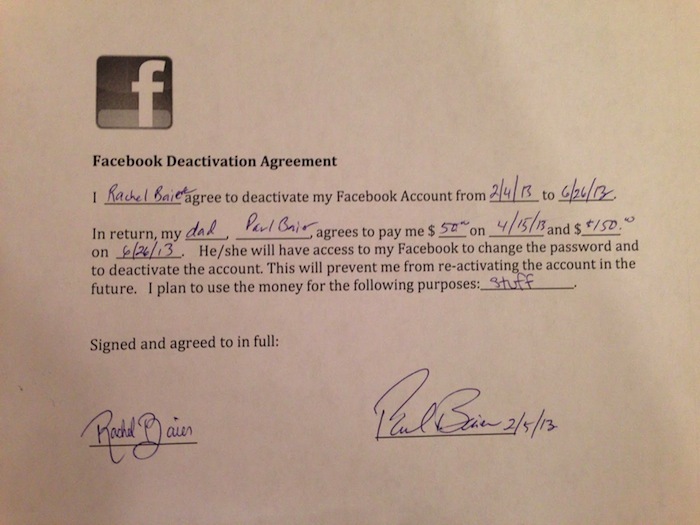 Titled the Facebook Deactivation Agreement (hey, this might catch on), the contract stipulates that in return for Rachel not logging into her account, her dad will pay her $50 in April and the remaining $150 at the end of the six months in June. The results of a research project published last year showed that young people were more likely to become addicted to Facebook, and that women were more likely to be addicted than men. Norway’s University of Bergen, where the research was conducted, came up with the the Bergen Facebook Addiction Scale comprising six statements which help to identify the warning signs of Facebook addiction. And it appears that Rachel Baier isn’t the only one keen to cut back on time spent on Facebook – research firm Pew said this week that a recent study of US users of the site shows that one in four plan to reduce the amount of time on Facebook this year.